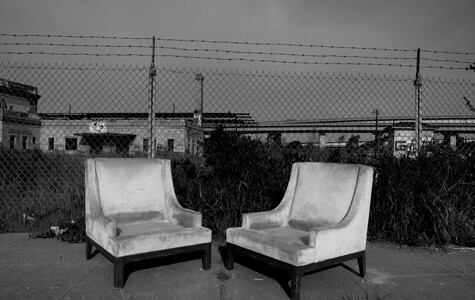 There are stretches of West Oakland where one could roam without encountering another soul; where the industrial lots and pastel facades take on a soundstage-like stillness. The same can be true, at times, even for the city's center arteries. Established residents no doubt remember the ghost town that was Auto Row during the Recession's nadir, and even today it is not uncommon to find a downtown BART station all but completely vacant on a Saturday afternoon. For all the chatter about Oakland as a place of activism, social shifts, and sometimes chaos, it can be a pretty quiet town — not a contradiction so much as a poetic disjuncture. The artists included in Scouting Oakland, a juried exhibition now on view at Compound Gallery, all seem to be keenly tuned in to, even obsessed with, this aspect of Oakland's surface identity. Participants were asked to capture part of the spirit of Oakland, but it is not the ghost so much as the shell that we see here. Even when artists make mention of things like rapidly shifting demographics and hipster influx in accompanying descriptions, their images tend to take on an air of stillness and contemplation — almost an aesthetic of stability. Dawline Oni-Eseleh's series of photographs depicting empty BART stations at night is emblematic of this quietude. According to an accompanying statement, the artist aims to capture an aspect of urban architecture that tends to recede behind the crowds. However, such a project would seem to be belied by the artist's use of encaustic to blur the photographs, overriding architectural clarity with a slightly abstracted, dreamlike patina. 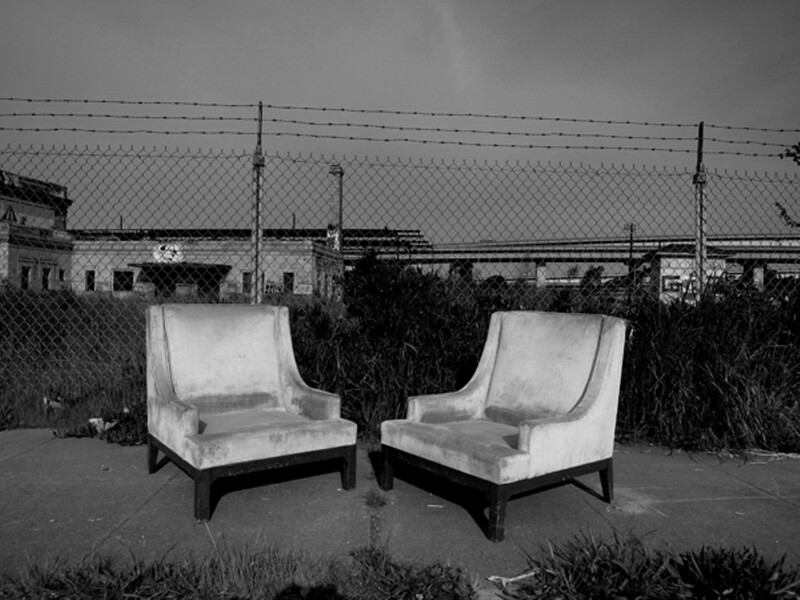 Working in a similar vein, Bart Frescura brings out the otherworldly in urban refuse: Two discarded living room chairs seem to luminesce on a dark-gray sidewalk before an empty lot. Angled toward one another, they suggest invisible sitters engaged in conversation. On the other hand, compare these to Maya Kabat's oil painting, which brings rectangular color fields into something resembling an urban grid from above. Her gestural work, however, suggests speed in an almost Futurist manner — anything but sleepy. Signage is another focal point among the artists trying to visually capture the spirit of Oakland. Often anachronistic, the signs are like snags against skins that the city would otherwise shed. Deanna Fainelli's screenprint depicts an old hotel sign attached to a black-and-white building, slammed against a pattern of in-your-face color: The calcified adorns the living. David Fullerton draws a neon sign for "Pat's Liquors" — a Sixties holdover on International Boulevard above a business that now has Asian owners. Fullerton senses a continuity in the new wave of immigrants retaining the sign from their Irish predecessors, but suspects that the inertia may be more of a factor than historical consciousness. His scrawled caption reads, "We are here now. We might as well make the most of it." What's supposed to be a funny play about a serious subject comes uncomfortably close to outright moralizing.